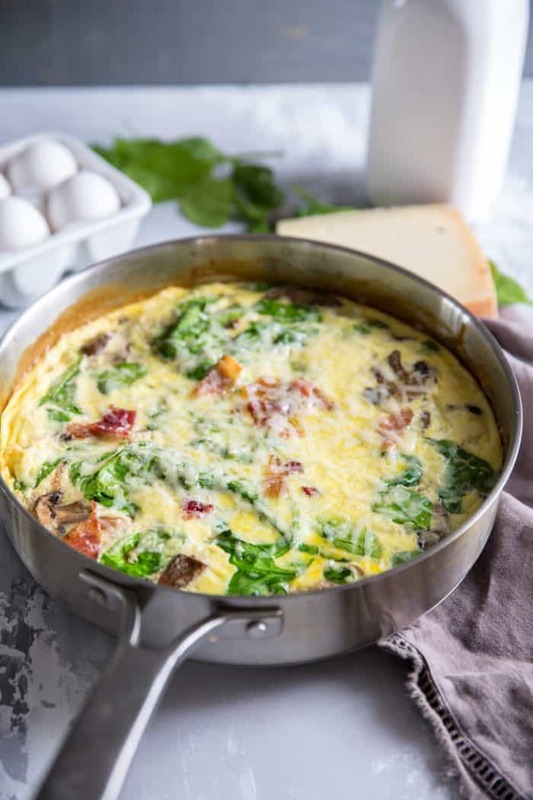 This spinach frittata is great for holidays, special occasions, brunch, lazy Sunday mornings, or when you need a quick and easy dinner idea! 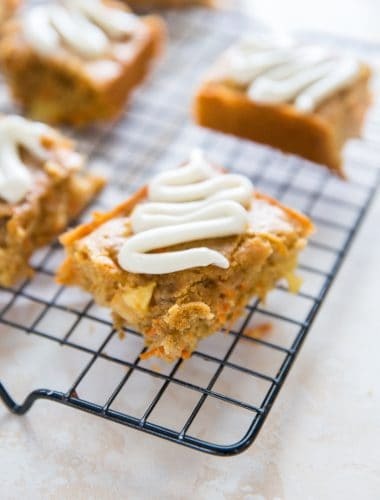 I’m proud to have partnered with the American Dairy Association Mideast to bring you this recipe. 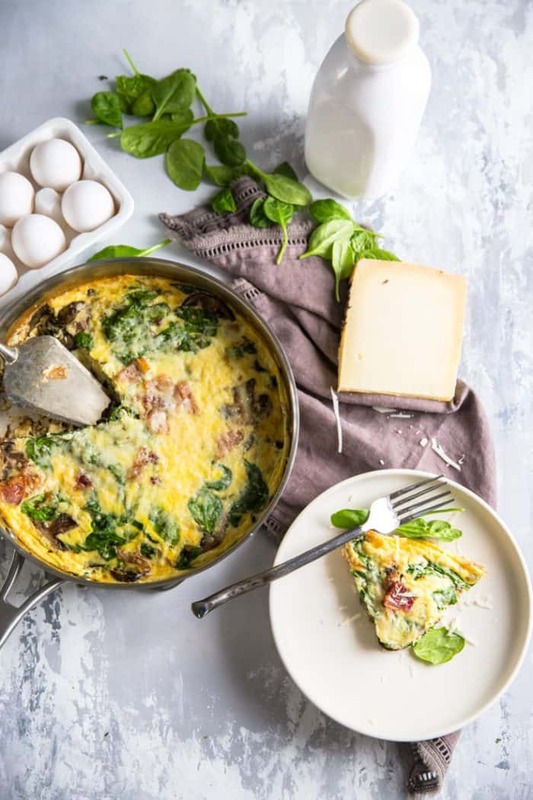 This spinach frittata recipe is one of those recipes that requires minimal effort, cooking know-how or ingredients. 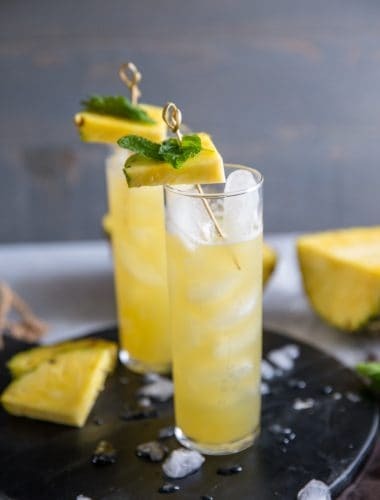 Sure, you need to do a little sauteeing, but other than that, this is a dump and go sort of recipe. Frittatas are adaptable, family-friendly, and can be served any time, any place! What Is A Spinach Frittata? 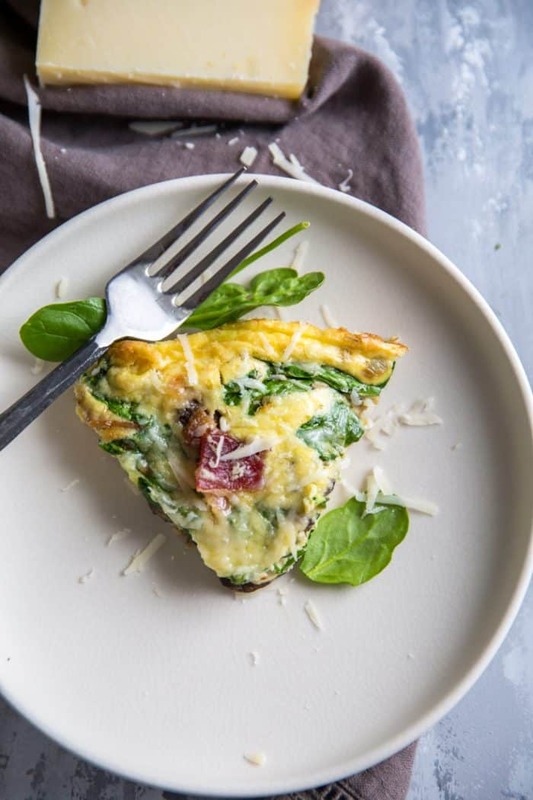 Let’s set aside the spinach for a second, and talk about what is a frittata. 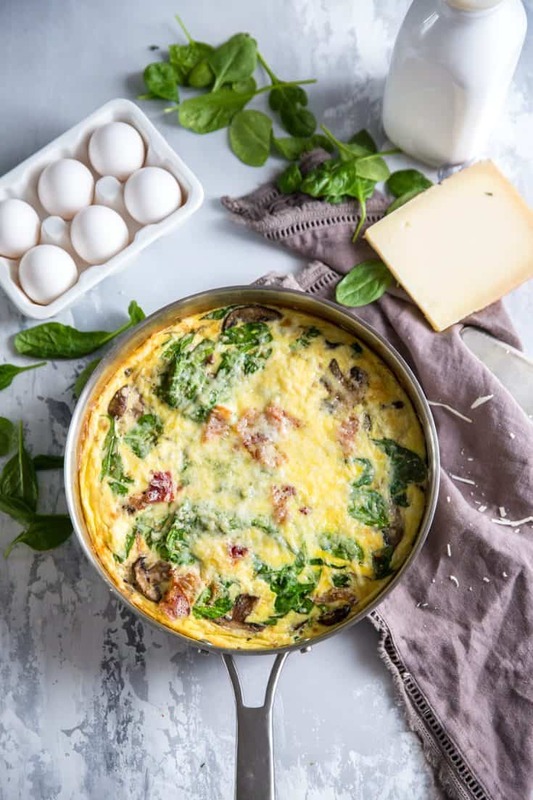 A frittata is an egg dish similar to a thick omelet or a crustless quiche, but it starts in a skillet and is finished off in the oven. Place a large, deep,(oven safe-a cast iron skillet works well here) skillet over medium heat. Add 4 pieces of uncooked bacon and cook until crispy. Remove bacon to drain. Reserve one tablespoon of bacon grease. Add a few onions to the bacon grease. Once the onions have softened, add a little garlic and cook for just one more minute. Now it’s time for some mushrooms. I used sliced baby portobello mushrooms, but you can use any mushroom you like. Season the mushrooms with rosemary and cook just until the mushrooms soften. Add the spinach next. I used about 3 ½ cups of fresh, baby spinach. It will look like way too much spinach at first, but I promise you spinach cooks down quite a bit. 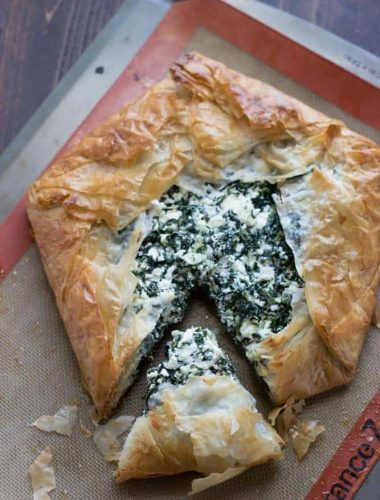 Make sure you don’t cook the spinach down completely, you still want it to be vibrant and to have a little bite. Season the spinach mixture with dried rosemary and salt. While the spinach is cooking, in a large bowl whisk together eggs, half and half, salt and pepper. Chop all but one strip of bacon, add the chopped bacon to the skillet. Arrange 1/3 cup of shredded Gruyere cheese to the skillet and whisk another ⅓ cup of cheese into the egg mixture. Pour the eggs over the vegetables. 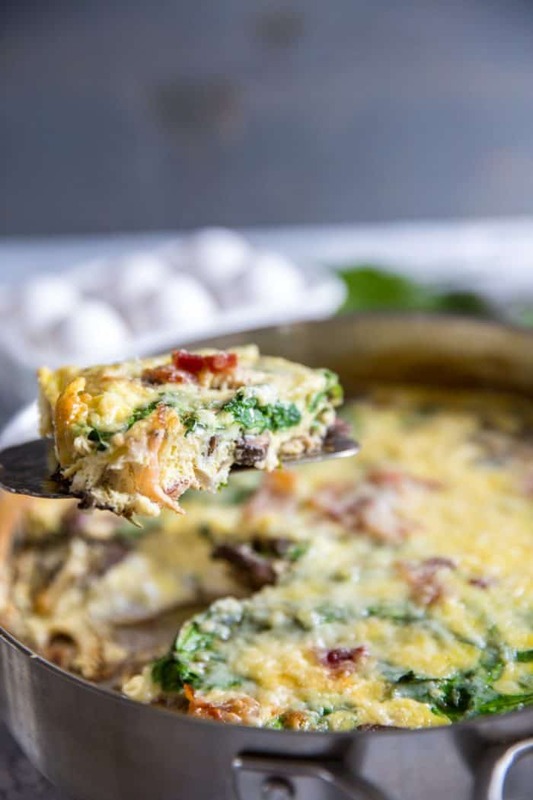 Top frittata with remaining piece of bacon that has been coarsely chopped. 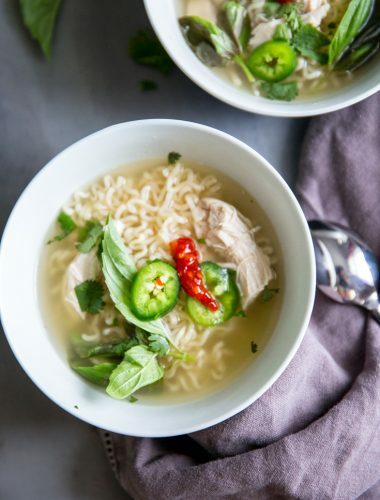 Place the skillet into a hot oven and bake for 10 minutes. Remove and sprinkle the frittata with the remaining ⅓ cup of cheese. Return the skillet to the oven and broil for 1-2 minutes or until the cheese has bubbled and the frittata is golden brown. I like to keep my sides simple when I am serving eggs as the main dish. 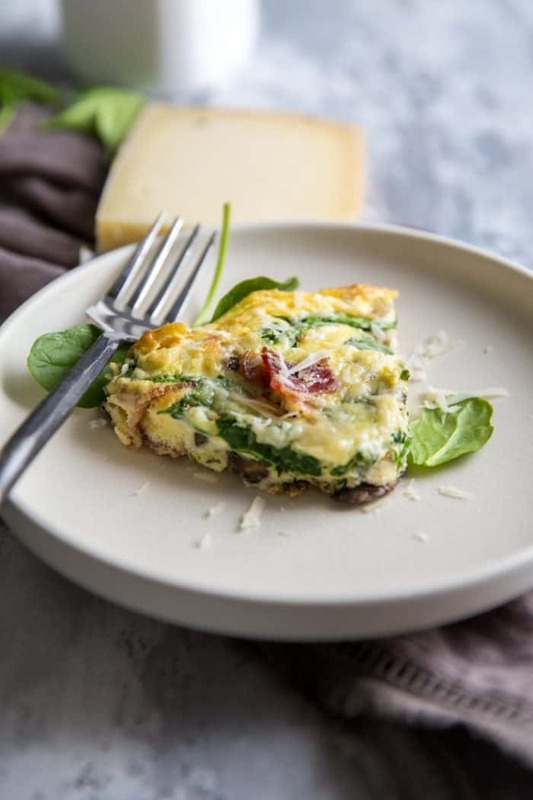 A fruit salad, A Mixed Greens and Citrus Salad, Quinoa With Roasted Peppers, and Scalloped Potatoes are all great options to serve alongside this spinach frittata. The vegetables in this dish are simple, to add more color and flavor, mix in sun-dried tomatoes, red peppers, caramelized onions, and chives. 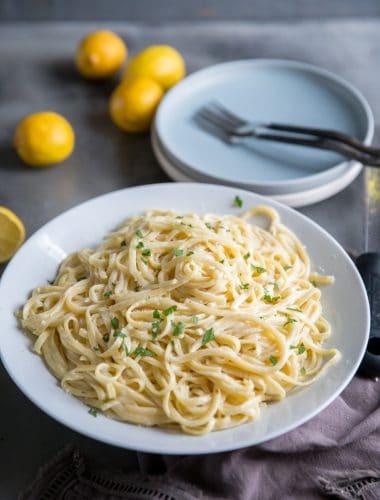 You can omit the bacon (use olive oil for the fat) and stir in pancetta, Canadian bacon or ham (great use for leftover ham), Italian sausage or shredded chicken. 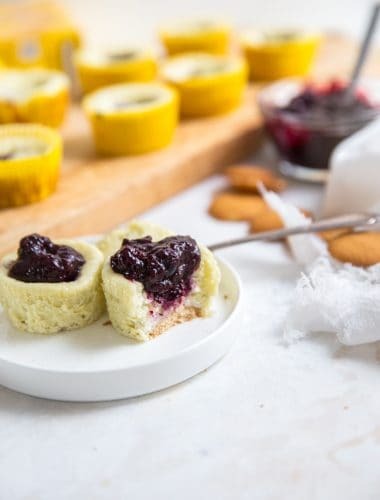 Feel free to use all egg whites for the eggs called for in this recipe. A tablespoon or two of plain Greek yogurt mixed in with the eggs will add a little tangy creaminess to the mixture. The Greek yogurt will taste great served on top too! 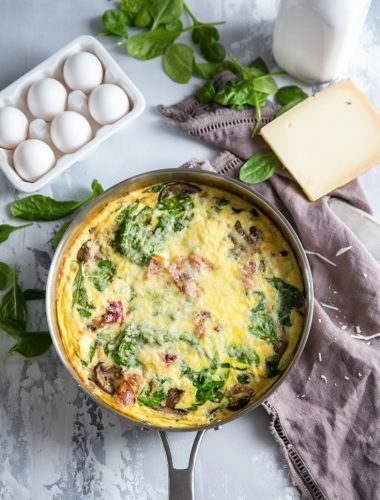 All the diary in this frittata; the milk, cheese, and yogurt (if using) contain a unique package of nine essential nutrients, including eight grams of high-quality protein. Dairy foods are a good source of protein. Protein helps us feel fuller longer and protects muscles after we work out, strengthens our immune system, and regulates our metabolism! 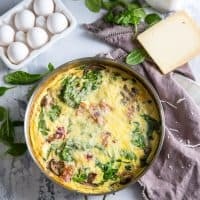 Can I Freeze A Spinach Frittata? Yes, you can. Once the frittata has cooled to room temperature, cover it completely and allow it to cool completely. Once cooled, place the frittata in the freezer. Frittatas can be frozen for up to 2 months. To reheat, allow the frittata to thaw in the refrigerator. Unwrap the frittata after a few hours so that condensation doesn’t form. Once the frittata has thawed, reheat the frittata in the oven. 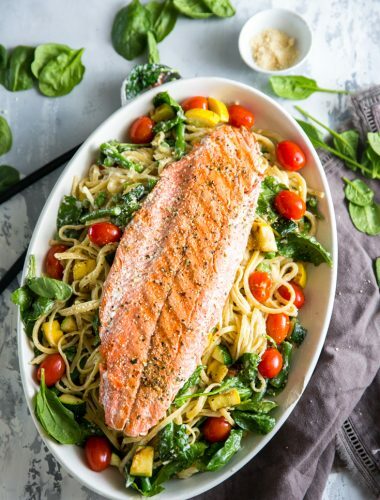 If you plan on freezing this dish, I would suggest baking it in an aluminum pan. 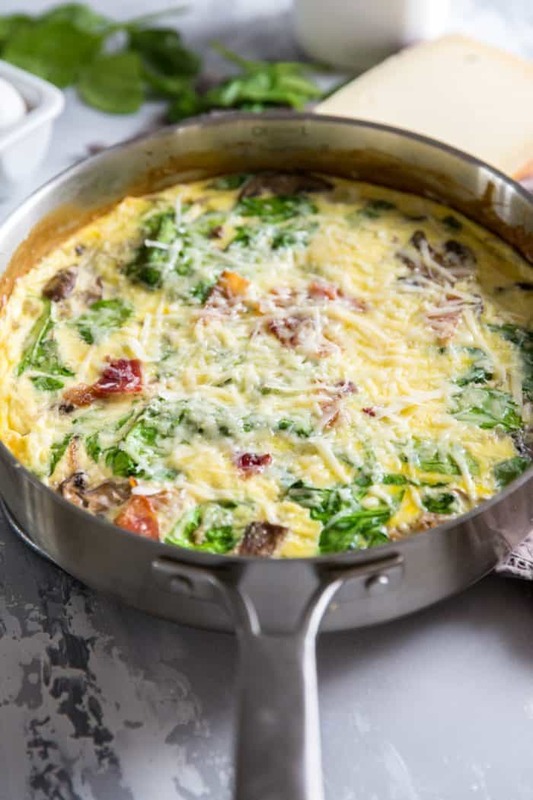 This Spinach Frittata is loaded good stuff, from the vitamin-rich vegetables to the protein-packed dairy. Eating a nutritious breakfast that includes low-fat or fat-free milk helps meet daily nutrient needs. In fact, milk is the number one food source of nine essential nutrients for children and six essential nutrients for adults. 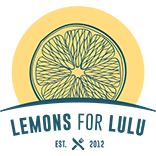 You may not realize that when it comes to dairy, Ohio and West Virginia dairy farmers raise more than 268,000 dairy cows on about 2,200 dairy farms. In an average year, Ohio and West Virginia dairy cows produce approximately 5.6 billion pounds, or about 656 million gallons, of milk. 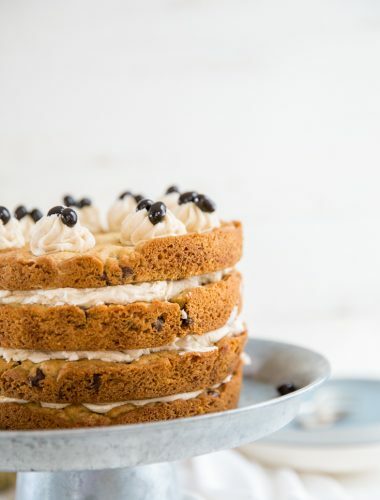 For more information about dairy nutrition, to find delicious new recipes and to meet Ohio and West Virginia dairy farmers, visit www.Drink-MIlk.com, and follow the American Dairy Association Mideast on Facebook, Twitter, Pinterest and Instagram. Heat a large, deep, oven-safe skillet over medium heat. Cook bacon until crisp. Remove bacon and set aside. Wipe out all but 1 tablespoon of bacon grease. Add onions to the hot skillet and cook for 3 minutes or until they begin to soften. Stir in mushrooms. Cook until mushrooms begin to soften. Season vegetables with salt and rosemary. In a large bowl, whisk together the eggs, milk, salt and 1/3 of the cheese. Add 1/3 cup of cheese to the vegetables along with 3 strips of the bacon, chopped. Pour eggs mixture over the vegetables. 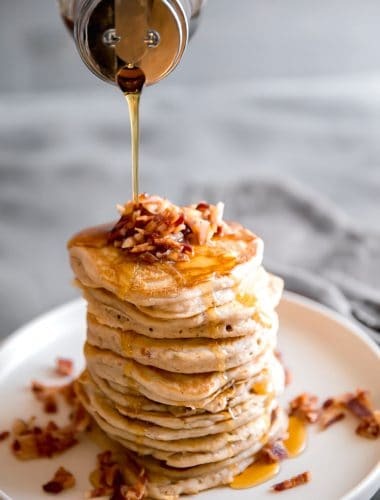 Top with bacon. Bake frittata for 10 minutes or until edges are golden brown and the center has set. Top frittata with remaining cheese. 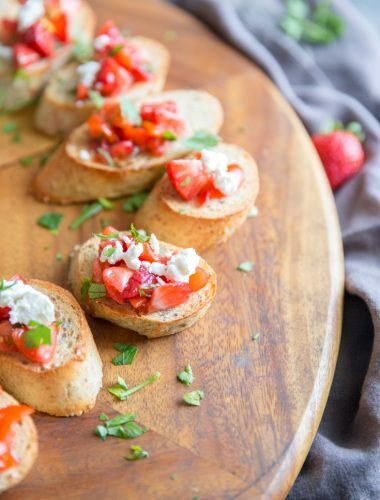 Broil with for 1 minute or until bubbly. Serve with extra cheese if desired.